If you are in the market for a heavy duty versatile power rack then you need look no further, with an 800lb max capacity on the safety bars and 500 on the catchers, the Valor Athletics power rack has been built for serious lifters and strength trainers. 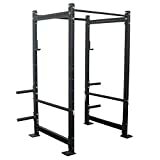 Valor racks normally include that little bit more than most racks in this price range, and with the db7 there’s no exception, rather than having to buy a lat pull separately as an attachment, Valor supply you with one within the price, which is great news for lifters who need some constant resistant exercises in their workouts. With a tough 12 gauge 2″ x 2″ steel frame Valor hasn’t held back on quality either, which is a risk when offering so much at this price. Let’s take a quick look at the product description and then we will have a more detailed look at this versatile rack from Valour. At 86″ fully assembled the Valor is not as tall as a full rack like you would see in your local gym, they measure around 91″ inches, but it’s still quite tall at 86″, so given you need to allow some headroom above the height of the pull up bar of around 12″, you will be looking at around 8 foot ceilings for this one, less if you’re not going to use the pull up bar. 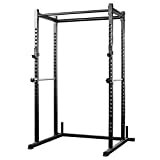 At 135lb it’s no beast of a rack, you will hear other reviewers saying this rack is heavy, it’s actually not that heavy in the world of power racks, commercial quality heavy duty racks weigh over 200lb and cheap budget racks around the 100lb mark so you’re kind of in the middle with this rack. Normally with weight comes stability and this rack is stable but it lacks any pre-drilled holes in the base supports to bolt it to the floor. I would think any out of rack work especially if you lift heavy will cause the rack to wobble a little. If you can, I’d recommend drilling your own holes and bolting it to the floor. Made from strong 12 gauge 2″ x 2″ steel the fame lacks the heavy gauges of commercial quality, would have loved to have seen the industry standard 11 gauge steel with this one but the 12 gauge 2″ x “2 frame should hold the 800lb max capacity. There’s definitely room here for some serious lifting, you can use the bar catches inside the rack to lift up to a max weight of 600lb while on the outside a little less at 500lb, but as I mentioned earlier it might be best to bolt this to the floor if you are going to lift that heavy outside of the cage. The cage is fitted with rubber feet, this will help with any slippage issues. 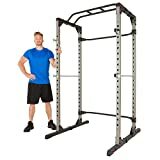 It’s not a commercial grade rack but it is a very well built rack for home use, 800lb should be enough for most lifters even serious strength guys will get some heavy use from this rack, and for the price, I’m impressed so far. Hole spacing is measured in the distance from the centre of the two adjacent holes of the uprights, and it’s more important than many people think, the spacing will affect your reach, level of comfort and range of motion when setting up and performing exercises. Ideally, we look for 2″ spacing with 1″ – 1.5″ westside spacing, the Gold standard. The cheapest racks have spacing of 4″ + which is almost unusable for bench pressing, the Valor Athletic power rack is somewhere in the middle with 2-3/4″, not a deal breaker and should just be ok for benching but some of you may find this larger type of spacing critical in your ability to progress past training plateaus. These things should be able to handle 700 – 1000lb on the spotter rods, and the 800lb of the Valor is right up there with some of the more expensive heavier gauged racks. It’s important to see over 700lb capacity from any power rack for the safety bars, over time you’ll be surprised how strong you can get. There are 4 catcher bars supplied with this rack, which you can use inside and outside of the rack, 500lb max capacity outside and 600lb inside. Valor also supplies you with 4 weight plate holders as standard, always good to see holders included in the price, you’d be surprised how many racks that cost $1000+ don’t even supply you with these. The weight plate holders are 1″ in diameter so they fit standard weight plates, you can fit your Olympic 2″ plates here too but I’d recommend you fasten them with springs to stop them rattling, or just buy the 2″ peg adaptors. The rack depth determines how much forward and backward space you have for bar travel. For powerlifting, rack depth is not as crucial, because the bar travels in a straight line for squats, presses, deadlifts etc, but for most of us who are into bodybuilding our exercises include arc based movements, such as curls and extension and it’s here the rack depth plays a crucial part. We want to see racks with at least 23″ between the pillars anything less and you will be too tight for space in there, You need to feel comfortable and be able to use the rack for as many movements as possible. Excellent to see the Valor rack comes in at close to 24″ pillar to pillar, so with a hight of 80″ inside of the rack and an inside width of 43″, your lifting environment is fairly spacious. You’re going to spend a lot of time in there so it’s important you have enough space. Attachments: What Comes With The Rack? What Can I buy? We touched on earlier the Valor comes with 4, 8” plate storage pegs and 4 solid steel chrome adjustable weight bar supports. But what’s great about this rack is the addition of its cable pulley system, this includes both the lat pull down and low pulley system for seated rows. Why do we need a pulley system? So, probably the main selling feature of the Valor power rack is you get a cable pulley system all in with the rack, which is just great, saves having to buy an additional pulley system which costs anywhere from $150-500 depending on whether you buy a stack or weight plate type pulley. The only downside of having a weight plate pulley system like the Valor instead of a stacking system pulley is for techniques such as drop sets or Russian ladders, it becomes a pain in the glutes to keep rushing behind the rack to keep adding and removing plates. But to have one at all is a big bonus for your training so a thumbs up here for the Valor rack. Valor sells a set of dip handles that can be used inside and outside of the rack as you can see in the pictures on the below. They sell for around $40. If you’re going to buy just one attachment for your rack buy a set of these :). Summary A strong well built power rack that includes just about all you need to make the transition from dumbbell work to rack work that much easier. Great to see a pulley system included with the price, this rack will take up a fair bit of floor space so make sure to measure well before purchasing. Overall an excellent rack for the price bracket.